“Are you here for the wine dinner?” asked a smiling gentleman as I entered Elm Restaurant in New Canaan, shaking snow flurries from my coat. Before I knew it, he was whisking us away behind the bar, past a few tables, and into a smaller dining room tucked away in the back. The area felt cozy and intimate. Four glossy walls framed the small space and a table set for eight sat in the center. Nearby stood a countertop, where a few more guests could perch while looking into the bustling kitchen. The décor made the room even more impressive. Sleek furniture, defined edges, and artsy prints gave it a modern vibe. At the same time, the space had elements of a farmstead. Curved pots with tufts of grass punctuated the table, which was lined with bamboo-like placemats. It was a brilliant fusion that I can only describe as contemporary rusticity. Chef Brian Lewis’s passion and knowledge was evident from the moment we entered. Lewis has an impressive pedigree. He trained at the CIA, and has been cooking since he was 13. Lewis executes a wide range of cuisine with skill and often integrates cooking styles from different regions into the restaurant. He spoke with lightning speed about the inspiration behind the night’s event as well as ideas for the future. He and Barbour envisioned a series of dinners that would highlight remarkable ingredients by pairing them with carefully crafted wines. They imagined working together to prepare weekly meals and informally decided to base each one on a specific region. Other than that they have few plans. They prefer that the dinners unfold naturally from their creative whims. 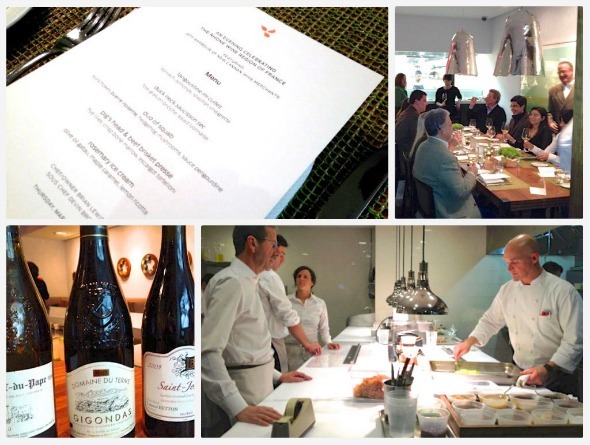 For this dinner the two focused on the Rhone Region of France. They wanted to embrace the season, which they call “the heart of winter,” and felt that the area’s cuisine and wine would best embody it. Jeff proved an interesting, compelling character. He partially reminded me of a classic schoolteacher, clad in a plaid tweed blazer and round spectacles while pointing to a map on an easel behind him. However, he also had the gusto of an entertainer. He relayed information with passion and inflection that cast a spell over the people assembled in front of him. His interesting personal story matches his dynamic personality. He originally went to the University of Illinois for education, but made an abrupt move to the restaurant industry. He wound up moving to New Orleans to help out a friend with Commander’s Palace. He assumed the position of receiver’s clerk, a job that was far from glamorous. “I was working in the basement, on the second tier of hell. I was practically counting cabbages,” he recalls with a touch of hyperbole. Luck changed when a young, unknown chef by the name of Emeril Legasse took over the restaurant. Legasse saw potential in Barbour and enlisted him to help develop the wine program. By his second year, Barbour was directing the program and cultivating the love of wine that got him where he is today. “He wasn’t famous then. We were both beginners, in it together,” Barbour revealed. Barbour ushered us into the evening with a brief introduction to the Rhone region and wine nuance. Then, dinner began with a “langouistine mi cuites” with spinach, almonds, and shellfish vinaigrette. A few kernals of puffed wild rice gave the small yet decadent plate a pop of texture. Barbour paired that with a Châteauneuf-du-Pape Blanc, a rare find considering that specific area is known for its reds. The glass had a beautiful golden quality that comes from grapes that are almost brown when harvested. The wine had elements of toasted raisin that truly enhanced the flavor in the langouistine. Next, Chef Lewis presented “duck neck saucisson sec with foie gras en brioche and salad lyonnaise.” While everything I tasted that evening sung, this one was my favorite of the evening. The foie baked into the brioche toast, especially, resonated with me. Black truffle added yet another touch of richness. Coincidentally, the wine paired with that course also emerged as my top choice from the evening’s selection: Gigondas, Domaine du Terme, 2007. The “rich gamey red wine” is a blend of Grenache, Mourvedre, Carignan, and Cinsaut. The wine felt velvety and smooth; there was little to no detectable tannin. The Gigondas also went with the third course, a duo of squab. This dish was defined by its remarkable presentation. A small thigh sat to the side of the plate, but right next to it stood the leg, pointing straight into the air. The leg was wrapped in Khadafi, thin crispy straws of phyllo dough, for added texture and flavor. Sunchokes buerre noisette, mushrooms, and sauce perigourdine tied everything together. Chef Lewis continued to dazzle us with precious proteins in the fourth, and main, part of the meal. He served a “pig’s head and beef brisket presse with five lilies, crisp bone marrow, and escargot tortellini.” I also noticed some pickled onions and a drizzle of red wine as garnish. Words cannot do justice to perfectly executed pig’s head. The tender meat literally fell apart when it grazed my fork and melted in my mouth. A Saint-Joseph Domaine Laurent Betton 2009 accompanied the plate. Barbour urged us to take notice of a “burnt characteristic, almost like bacon.” Unlike the other red, this one was a single varietal, Syrah. Its tannin level was higher as well. Barbour intentionally chose a higher tannin wine to compliment the fattier nature of the proteins. The course seemed downright hedonistic, and I relished in the rich decadence of the pairing. By the time the dessert arrived, the noise in the small space has increased to a light roar. As the wine flowed and we got to know each other, the sounds of hardy laughter and impassioned conversation reverberated around the room. We savored rosemary ice cream, olive oil gatau, maple caramel, and lemon ricotta alongside a dessert wine: Muscat de Beaumes-de-Venise Durban 2009. The wine had an unexpected port-like quality that I enjoyed immensely. As the dinner drew to a close, I found myself disappointed that the evening couldn’t last forever. Fortunately, Elm Restaurant has many exciting events in store for the weeks ahead. Chef Lewis and Jeff Barbour plan to continue the wine dinners weekly, most likely on Wednesdays. In addition, Chef Lewis is looking forward to “The Whole Hog Dinner” on Thursday March 14. Elm will partner with Craft Butchery of Westport to foster an appreciation for local pork and meat. Other happenings include cheese pairings and cooking classes. For a complete calendar of events, please visit http://www.elmrestaurant.com/?post_type=post&category_name=chefs-notes . New Canaan Wine Merchants has exciting offerings as well. For one thing, all of the wines that we enjoyed at the dinner are available for purchase. Moreover, Barbour teaches wine classes that cover a range of regions and sometimes include cheese. Visit http://www.newcanaanwine.com for all of the details. Both Chef Lewis and Jeff Barbour sought to bring people together “in a close intimate way.” They aspired to create “the feeling of the comfort of home.” By the end of the evening, I truly felt as if I was among close friends. The exceptional food, artistic pairings, intricate ambiance, and engaging conversations all made for an evening I will never forget.